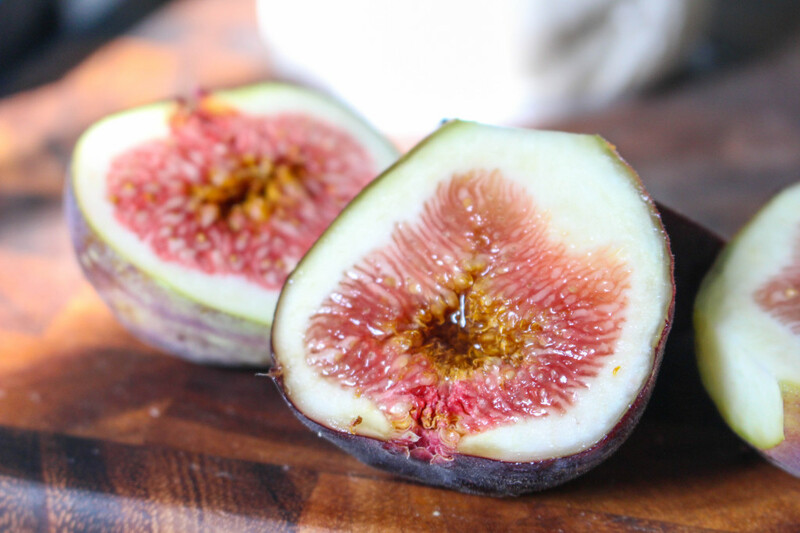 Figs are such a treat this time of year. I rarely find “good” figs at the stores around here, and when I do, I have to resist all urges to sink my teeth into them on the spot. Because they are such a rarity, I try to use them simply, in ways that only highlight their lovely sweetness. 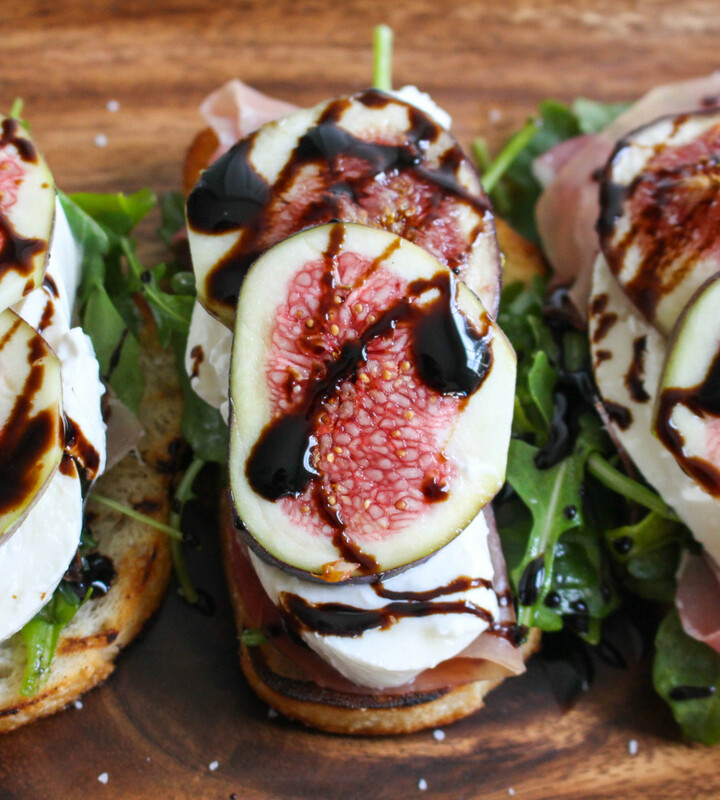 These crostini are probably one of the best uses of figs I’ve ever come up with. They’re quick, easy, and definitely highlight the special ingredients. We are still in the midst of our kitchen renovation, which unfortunately, has turned into a massive project affecting far more than just our kitchen (to name a few affected areas: my sanity and stress level). I have basically cried 495358 times over various renovation issues (I even drove around sobbing one Saturday morning for like a half hour…pregnancy hormones are in full effect!). It’s a long story…perhaps one that I’ll share one day…but for now, just know that I’m doing my best to still provide interesting recipes on this site, despite having only a fridge and a microwave to my name at the moment. Oh, and a grill. The grill has been a lifesaver. We’ve been doing tons of grilled meats and veggies each week (one of my favs being this grilled corn salad), and grilled bread has become a staple in my life (it’s a must-have side to every salad I consume these days). I think it’s one of the best way to consume carbs. And that’s really saying something. I’m trying to grill as much bread as possible before the weather turns in the fall. I’m such a wimp about grilling in any weather cooler than 50 degrees. We even got adventurous this past weekend and tried this skillet cheese on the grill. It would have worked like a charm had we not walked away from it momentarily and completely charred the bottom of the cheese. Sad face. We’re figuring it out, though! 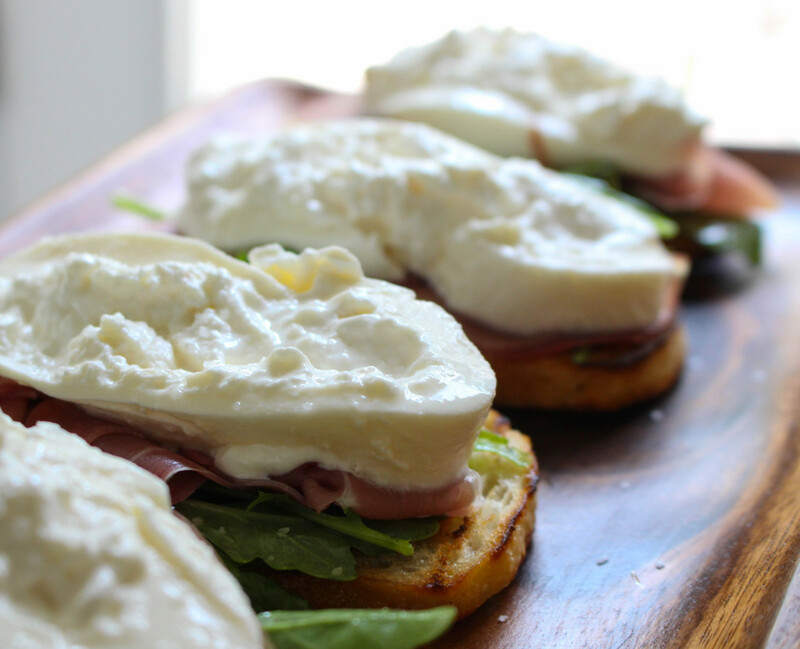 This appetizer comes together so quickly. The only cooking you really have to do is to grill the bread, which I clearly think is both amazing and necessary. Everything else is ready straight from the fridge or pantry. It’s perfect for summer, and perfect for those going through a kitchen hiatus lasting doubly as long as it was supposed to. Heh. 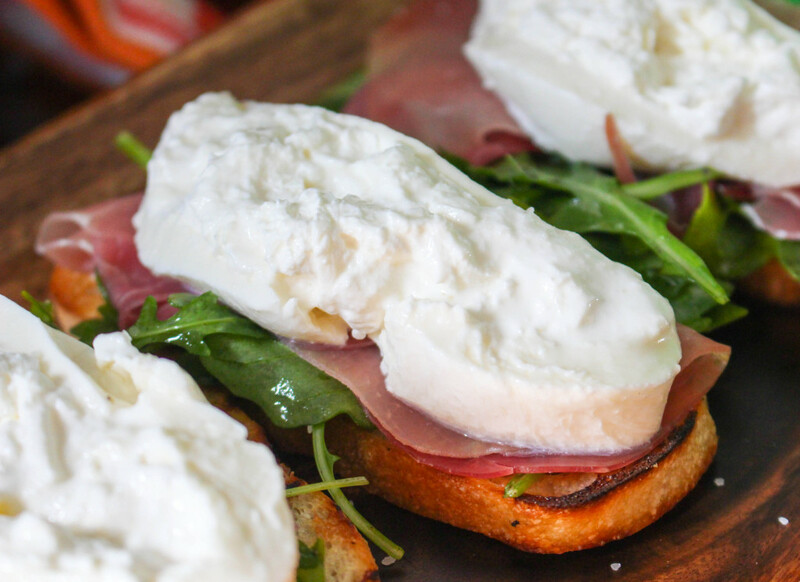 Between the smoky bread, insanely creamy burrata cheese, salty prosciutto, and sweet figs…these little bites are pure heaven (and have managed to keep my hormonal sobs at bay…for now)! 1. Preheat the grill to medium and drizzle the sliced bread with olive oil on both sides. Place the bread on the hot grill and cook for a couple minutes per side, until slightly charred and toasted. Remove from grill, and while still warm, rub the bread with the halved garlic. 2. 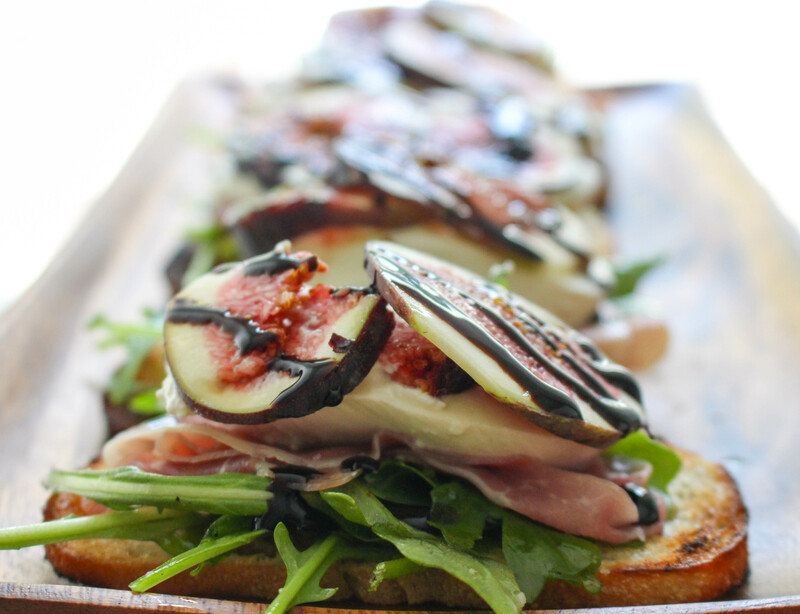 Top the bread slices with the arugula, prosciutto, burrata, figs, a drizzle of honey, and a drizzle of balsamic glaze. Season with salt and pepper. Serve! That thick slice of cheese – I am starving!! Btw these crostinis look seriously tasty!! Can’t get any better than a thick slice of cheese! Thanks, Ami! This is my type of snack! Love figs with burrata.